Celeste Kranick (above, foreground) asked the Wyoming County Commissioners on Tuesday and if the courthouse could “go purple” this weekend for the Wyoming County Going Purple for National Overdose Awareness event scheduled for Sunday, Aug. 26 at 2 pm on the courthouse lawn. It was a particularly rough weekend for a number of families in Wyoming County and first responders as a particularly strong batch of heroin moved through the area. At least eight overdoses have been confirmed, three of those resulting in deaths in the county. A fourth county resident died outside the county. Wyoming County EMA director Gene Dziak said that at least four people were saved by first responders who administered naloxone, the controversial antidote to opioid overdoses. “Just when you think that things are moving ahead and things are getting better, we get whacked in the head,” said a frustrated Wyoming County Commissioner Tom Henry. “We have a lot of things going on,” he added in reference to the efforts of the HOPE Coalition, Wyoming County CARES and other organizations. 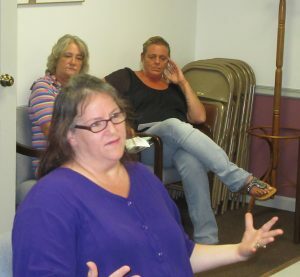 Long-time advocates for persons with substance use disorder (SUD) Celeste Kranick and Lizz DeWolfe visited the commissioners at their regular public meeting on Aug. 21 to talk about the local situation and to discuss what might be done in conjunction with National Drug Overdose Awareness Day, which is Aug. 31. “It’s sad that we have to have a day for that,” Commissioner Judy Mead lamented, as aware as any at the table of the cost of addiction and overdoses to society. “They don’t seem to care what they’re doing to their families,” she said in reference to those who have overdosed. “Most of the people around here are still in the dark,” Kranick responded, suggesting that fear, ignorance and the stigma of SUD are preventing people from taking advantage of available resources or accepting assistance that is offered. While this past weekend was particularly devastating, with almost everyone in the room knowing someone who had died, Dziak and Kranick indicated that 2018 is on target to be the worst year yet in the opioid epidemic crisis, both nationally and in Pennsylvania. Twenty-eight doses of Narcan have been used in Wyoming County so far this year, and Wyoming County EMA will have to order more to replenish depleted supplies. “We knew when we got into this that we were at least five years away from the peak,” Kranick stated. DeWolfe maintains that an underlying cause is the apparent abundance of heroin in the area. She expressed her frustration that there have been no major arrests of heroin dealers, let alone murder charges levied against them. “Somebody is dealing death in this county,” DeWolfe asserted. “And God help them if I find them.” DeWolfe lost a son to a heroin overdose in 2015 and a nephew this past weekend. Commissioner Ron Williams wondered aloud whether it would be helpful for the press to alert the public when it is known that a particularly dangerous batch of heroin is being sold. Mead noted that Kranick and other like-minded people are vigilant on social media with updated warnings. The general and begrudged agreement, however, was that such announcements only serve to make the drugs more attractive to those who use them. Kranick proposed a weekend event at the courthouse that might once again serve to educate the public on the dangers of opioid and other drug abuse, allow agencies who provide services to people with SUD and families who have lost loved ones to overdoses, and generally remind those who are dealing with addiction that there are people who want to help them. “We’re here. We see. We care,” she stated. Kranick suggested decking the courthouse property in purple, noting that Rev. Lou Divis and St. Paul’s Lutheran Church would donate purple ribbons. 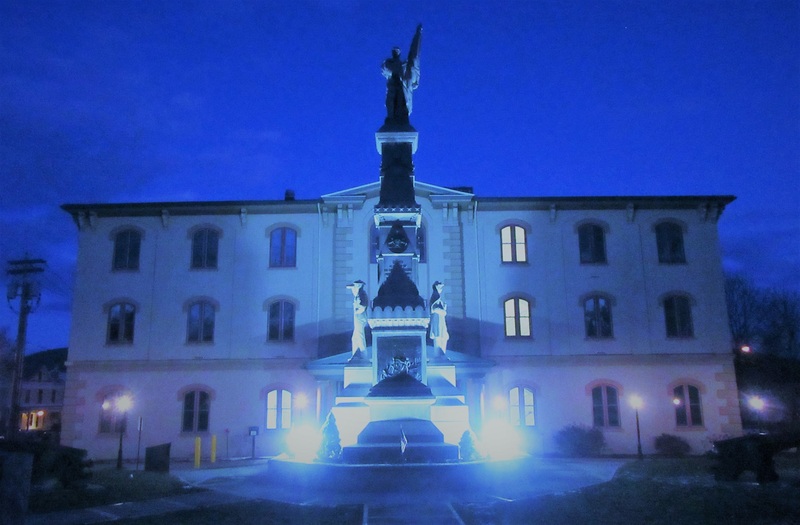 At Mead’s suggestion, the commissioners agreed to purchase purple floodlights at their personal expense that could be installed as early as Friday to draw attention to an event planned for 2 pm on Sunday, Aug. 26 on the courthouse lawn.